For the heart bases of each page, I used my Marvy-Uchida big ol' heart-shaped punch on some cereal box cardboard. Then I went through and glued on red and pink and other sweethearty papers and fabrics. Then I went through and embellished each page, each side. 5 pages in all, double-sided. And we finish with an lolcat for good measure. I hope you like it!!! Ughhhh, my guts.... I am hereby vowing never to eat pork again. I made porkchops today, and boy were they horrible. My belly is not pleased with me right now. The house still smells like porkchops....Ugh..... Unrelated: I carved this stamp block yesterday. Then I made some fabric! I think I'll use it to make a page in my fatbook. Anyway, must. go. lay. down. porkchops. bad. Yay! Another fatbook page! I rescued this piece of fabric from the fabric trashpile. The women at my church are making blankets for Project Linus and were going through donated yarns and fabrics last night. They were throwing out a little piece of this vintage fabric because: 1. It was too little, and 2. It looked like it had been left out in the sun and was faded/discolored. Yoink. Add a felt polar bear and BAM, you've got yourself a fatbook page. Here's the other side of it with some felt flowers with beads and lace. I hope you guys are as pleased with him as I am :) Happy Monday, indeed. Here are a couple more postcards to look at! On this one, I used the octopus stamp that I carved a while ago and embossed it with my new heat gun. Embossing is so fun, but the little embossing crystals get everywhere and usually end up all stuck to my forearm somehow. A simple doodle postcard using the patterned back of some used stationary. I love drawing jellyfish. It's all the little tentacles! So, I've noticed a lot of my blogger friends are making lists of crafty things they want to do this year. I think that's an excellent idea! I've already been inspired by so many people to try making new sorts of things! To name the ones I have in the front of my mind: a mini altered journal, a fiber fatbook (already started! ), a book of chunky pages, and an illustrated storybook with pop-ups. This year feels like it's gonna be filled with books. Can't wait!!! I'm trying to use up scraps and little bits, so with this one, I was able to use some tiny scraps along with some old hammerhead doodles I was hanging onto. I was trying to figure out the eye and mouth placements. There's some story I can hardly remember where a bunch of animal musicians wander around stacked on top of each other... I wish I remembered what it was, but this doodle is inspired by it. Aaaaaand another little monster. Not so scary... it does have some pretty sweet abs, though. I need some postage stamps! If this looks familiar to you, it's because I did the beading last summer! This beaded butterfly has been on my inspiration board for a long time, and I thought it would make the perfect cover for my fatbook. So I stitched on the words and sewed it onto a piece of green felt. I liked the disheveled look of it initially, but I'm thinking I might want to seam-rip it and redo the edges for a cleaner look. I'll think on it a bit. Here's my 2nd page. It's yarn and zig-zag stitch on some upholstery fabric. I like how it turned out. I feel like I need to do a nice and neat structured page next, but we'll see what happens. Today, I started making some postcards for a Craftster postcard craftalong I'm doing. I just have way too much papercrafting stuff (Gasp! Is there such thing as too much?!) and I need to do a little de-stashing! The idea is to make a ton of postcards and send them to friends and family just to brighten people's day. There's nothing like seeing a handwritten address when you go out and get your mail :) Anyhoo, everyone participating in the craftalong will be sharing pictures of what we create on the thread. Pretty fun! Oops, I Craft My Pants? more like "Oops, I became a victim of happenstance!" Hey everybody, I've recently gotten some angry comments regarding the originality of the web address "oopsicraftmypants." I just wanted to address it real quick. Considering the popularity of the hilarious SNL sketch "Oops, I Crapped My Pants", and the awesomeness of crafting hobbies, it's not surprising that others have made the connection before. The phrase "oops I craft my pants" personally occurred to me while my family and I were in the car on our way to watch Avatar around Christmas. We were brainstorming blog name ideas to come up with something easier to say and remember than "i-crafted-this-today dot blogspot dot com" (a mouthful, right?) When my bro checked to see if the URL was available, it was, and I thought "Score!" and went for it. Unbeknownst to me, at the time I made these recent changes, there was a wonderful craft blog already existing at http://www.oopsicraftmypants.net. I had never heard of this blog before today, and never intended to copy or steal anyone's idea. I encourage all my readers to visit oopsicraftmypants.net, as it is run by a very talented and creative crafter. I wish her the very best and every success. I won't be changing my web address, as I believe the internet is big enough for the two of us and our own unique styles will be enough to differentiate. As always, thank you all for reading! I hope you know I appreciate all your support and positivity. I sewed up this little triceratops plushie this morning, adapting Martha Stewart's stuffed piggy pattern you can find here. All I did was lengthen the nose and make the tail pointy, then add the horns and crest. I had to hand-sew a bit near the crest, because things got a little thick with all that fleece going on up in there! I made a blue one last year for a swap, and I kinda wanted a triceratops around, so I made another! I came across the fiber fatbook craftalong on craftster today led by the talented morglanc, and totally fell in love with idea. Basically, you create a book page-by-page out of various fiber things. It's like an art journal, but super fat and made from softer things instead of papery things. Imagine all the cool things I can use... fabric scraps, yarns, embroidery, crocheted stuff, felt, weaving... Endless. This is going to be super fun! I love being able to use all my little scrappy stuff and this is the perfect way to do it! Today was one of those days with a to-do list about a mile long. Victory, however, is mine because I have accomplished 11 out of 15 tasks and I hope to complete all 15 by tomorrow morning. Boo-ya. 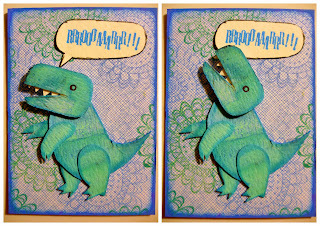 So after checking off task #10 (cleaning the craft room), I made this little movable dinosaur ATC to celebrate. His head tilts back as he rrroooaaarrrs!!! Bonus fun fact: the background is the inside of a security envelope you pay your bills with... I didn't need the envelope b/c I paid online... go recycling!